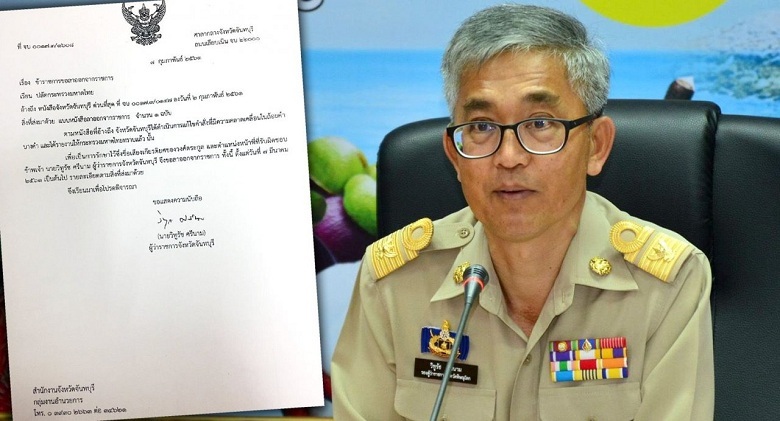 Interior Ministry permanent secretary Chatchai Promlert will make the decision whether to accept the resignation of Chanthaburi Governor Withurat Srinam following an embarrassing mix-up of terms used in an official document that he had signed. Interior Minister Anupong Paochinda said on Friday that Chatchai would decide about the matter, after the governor had sent in his resignation letter to the permanent secretary. “Personally, I have no comments,” the interior minister responded when asked by reporters. In his order dated January 31, the Chanthaburi governor had instructed provincial authorities involved to prepare for the upcoming visit by Prime Minister Prayut Chan-o-cha and a mobile Cabinet meeting to be held in the eastern seaboard province on February 5 and 6. However, a royal term was used in the document for a word meant to welcome the visiting Cabinet members. The governor had explained that the mistake occurred due to the template of an order for provincial authorities to prepare for the visit to Chanthaburi in late January of HRH Princess Maha Chakri Sirindhorn. He had rectified the mistake and issued a new order but offered to take responsibility for what had happened. “It’s my fault. I didn’t carefully read the printed letter,” he told a press conference recently. Withurat said yesterday that he had sent his resignation letter to the Interior Ministry permanent secretary to take responsibility for the mistake. He also met his bosses – both the interior minister and the Interior Ministry permanent secretary – on the sidelines of an event held in Muang Thong Thani in Nonthaburi province. Meanwhile, Deputy Prime Minister Wissanu Krea-ngam yesterday said that the governor’s supervisors have the authority to turn down his resignation letter. However, he added that he did not know the background of the matter.